Jing Chen, "The Physical Foundation of Economics: An Analytical Thermodynamic Theory"
All human activities, including mental activities, are governed by physical laws and are essentially thermodynamic processes. However, current economic theories are not established on these foundations. 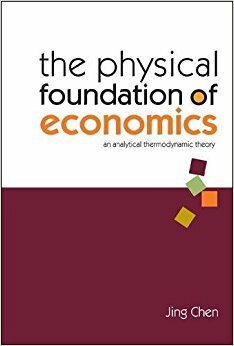 This pioneering book seeks to develop an analytical theory of economics on the foundation of thermodynamic laws. A unified understanding of economic and social phenomena is presented, an understanding that is much simpler than what mainstream economic theory has to offer. Its aim is to revolutionize thinking in economics and transform social sciences into an integral part of the physical and biological sciences.